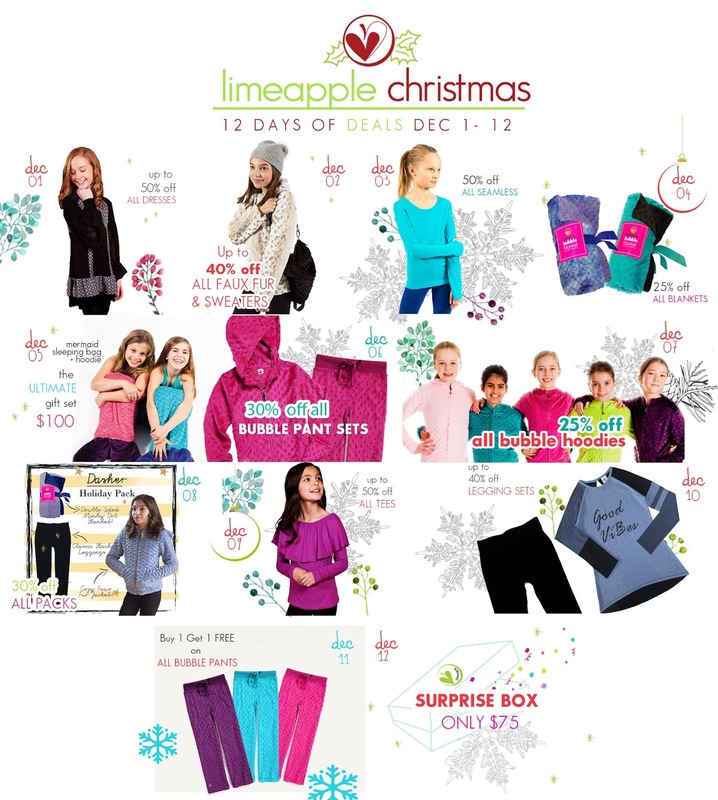 The 12 Days of Christmas Sale at Limeapple.com & A Giveaway! Gear up for a holiday sale too great to miss! Our favourite clothing for girls on the move is celebrating the 12 Days of Christmas Sale, running December 1st thru 12th! Each day will have a featured special, so be sure to scope the calendar out below so you don't miss something great! We have been fans of the Limeapple brand for a few years now, after purchasing our first Bubble pant set. Beebo loved how cozy the set was, while I loved Limeapples fun, practical and well made approach to clothing for girls ages 4 - 14. Their signature printed leggings can't be beat for wearability and they outlast other brands by far, while maintaining their shape with each washing. So... because they are our favourites, we have decided to GIVE SOME AWAY! Limeapple and Peekthruourwindow.com would love to send your little girl a Holiday set! All you have to do is follow the rules of the Rafflecopter widget below to play along. Each Limeapple Holiday set includes over $120 worth of clothing, with your choice of set: Donner, Dasher, Blitzen or Prancer. Giveaway ends Dec 9/17 at 12:01am MST. Must be a Canadian Resident to WIN & be over the age of 18yrs. I would choose the prancer (the mermaid tail is a must) and gift to my niece who just celebrated her seventh birthday. I would choose the Dasher and give it to my Niece! Thanks! I would pick the Prancer package and give it to my best friends little girl who would just love it!!! I would give to Prancer package to my daughter. I can just see her on that look. I will choose prancer for my seven year old daughter!